Elite media took to Pope Francis early and often, spinning him into a cultural icon of their making. Then they met him. So many folks who sit in studios hosting shows named after them that deliver news analysis, or anchoring news shows that feature live reports and panel discussions, or in newsrooms typing out copy as they see fit in these times, take their impressions from other news sources, whether videos or transcripts or reports in other big media. The week just ended gave them an encounter they weren’t fully prepared for, in spite of all the preparations. I covered the visit of Pope Francis from a studio on Capitol Hill in Washington D.C., gathering reporting as well from print and television sources to get the fuller picture of how this pope who has been featured on the cover of the Rolling Stone and Time Magazine and in dozens of other interviews and special features was actually being received live, in real time, in person. It was amazing. I especially noticed how CNN’s coverage showed how awestruck Anderson Cooper and Don Lemon and Donna Brazile and others were over the Pontiff, attracted by his humility and openness and more effusive praise than could be counted in a busy week. They saw him up close, in DC, with the president and lawmakers and the poor and marginalized, with babies and children everywhere, teachers and parents and grandparents. I have notes of reactions, overheard conversations, stories behind the stories, and hope to share them here this week. But after an astounding week of encounter with the real Francis and thus, the real Catholic Church, the enamored media and adoring public got this stemwinder from the Holy Father to cap the Festival of Families in Philadelphia. Go to about 2:09 into the video when Francis, newly energized by the events of the evening, goes completely off script. 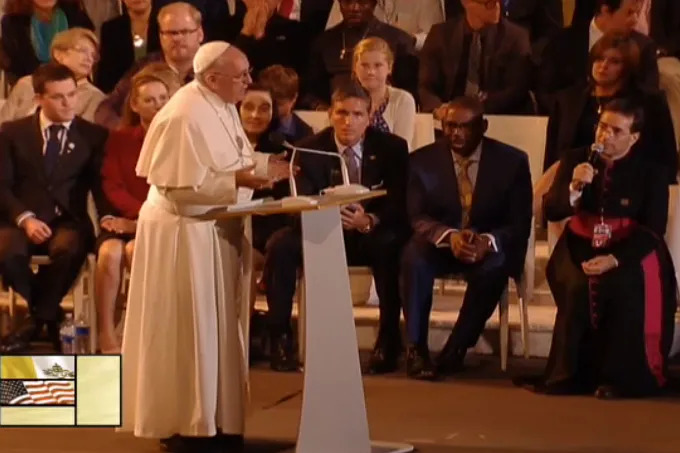 No text copied here could do justice to seeing Francis say it, tell it, gesturing with his hands, cracking jokes as he talked about the headaches children can sometimes cause, trials when families fight and ‘plates fly’, and “I won’t speak about mother-in-laws,” he said. More to come. Much more. ‘Epidemic of premature deaths’ needs our attention. Now.